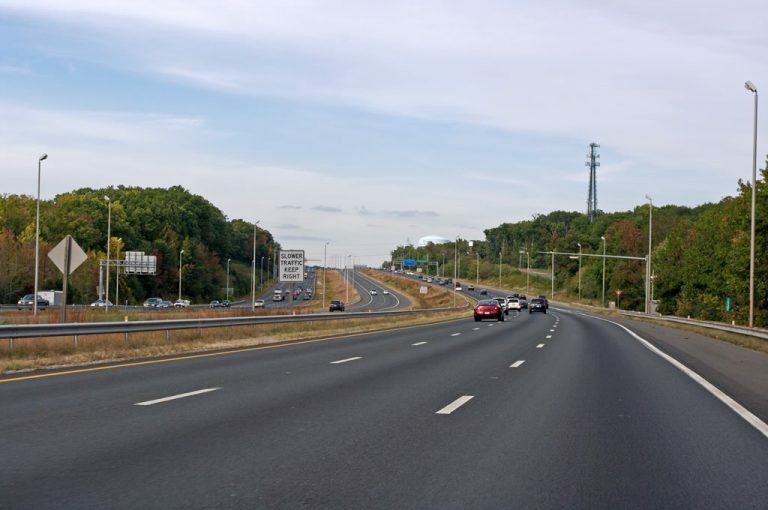 179 miles long in Virginia, Interstate 95 joins the Washington, DC area with Richmond both as a commuter route from Fredericksburg northward and a through route for travelers between the Northeast and Southeastern United States. The freeway varies between six and eight lanes from Petersburg northward to the Woodrow Wilson Bridge. The I-95 Express Lanes accompany 31 miles of Interstate 95 between Stafford and the Springfield Interchange with the Capital Beltway. The reversible roadway flows northbound during weekday mornings and southbound during evening peak hours. Prior to 2014, the two to three lane roadways were restricted to HOV-2 eligible vehicles. Work started in 2012 both expanded and converted the HOV roadway into a tolled facility, allowing non-HOV travelers the option to use the lanes at a variable toll rate. Tolls along the Express Lanes are charged electronically with E-ZPass transponders. HOV-3 traffic may use the Express Lanes free of charge, but only with an E-ZPass Flex account. 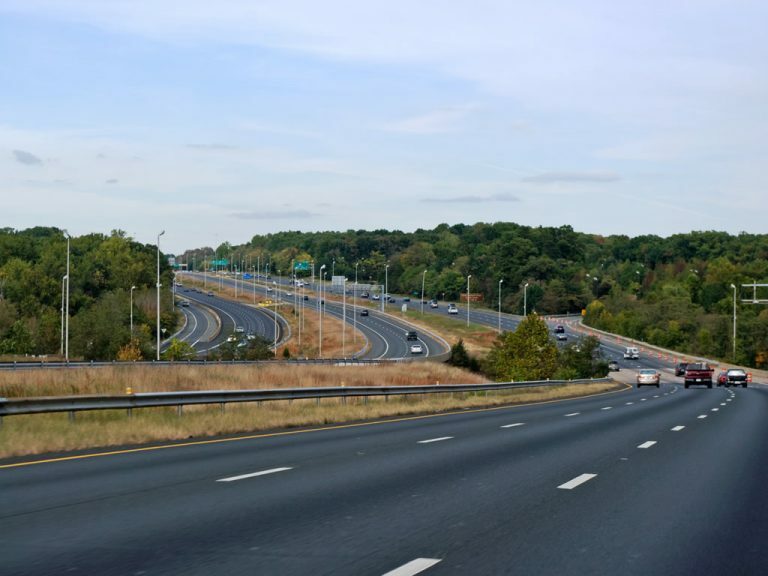 Through Northern Virginia, Interstate 95 expands with the reversible toll Express Lanes between the north and southbound roadways. This northerly view looks at the three roadway configuration of the freeway at milepost 153.2. Photo taken by Will Weaver (10/11/09). Previously beginning just south of Exit 152 (Virginia 234), the Express Lanes travel northward to the Springfield Interchange, where they transition down the middle of Interstate 395 to the 14th Street Bridge in Washington, DC. The two mile Southern Extension of the managed lanes to Garrisonville Road (Exit 143) was built from July 2016 to December 2017. Construction starting in Spring 2019 lengthens the Express Lanes another ten miles from Garrisonville Road to U.S. 17 / U.S. 17 Business (Warrenton Road) at Exit 133. Costing $595 million, work on the Fredericksburg Extension runs through Fall 2022. Interstate 95 at the car rest area south of Exit 156. Ramps occasionally allow drivers access between the tolled Express Lanes and the mainline of the freeway. Photo taken by Will Weaver (10/11/09). Designated the Henry G. Shirley Memorial Highway, I-95 from Woodbridge north to D.C. opened as Virginia 350 before the Interstate system was designated. The Shirley Highway was signed as Interstate 95 into Washington, D.C. until plans to complete the freeway into Prince Georges County, Maryland were cancelled by 1977. I-95 north of the Capital Beltway at Springfield was redesignated as Interstate 395. Interstate 95 between Petersburg and Richmond opened in 1958 as the Richmond-Petersburg Turnpike. Tolls were collected on the roadway until 1992, when bonds were fully paid off. South from Petersburg, Interstate 95 replaced U.S. 301 as the main route to Emporia and Rocky Mount, North Carolina. Portions of this freeway were not completed until 1982. Tolls were previously proposed along Interstate 95 between Petersburg and the North Carolina state line as part of the "Interstate 95 Corridor Improvement Program." Toll money was sought to generate funds for needed improvements. Wagner Road enters a full cloverleaf interchange with Interstate 95 & U.S. 460 west. The four-lane divided highway connects U.S. 301 (South Crater Road) with County Drive and Virginia 106 (Courthouse Road) in south Petersburg. U.S. 460 utilizes the arterial east from Exit 48 to County Drive. Photos taken 12/21/12. U.S. 460 splits from Wagner Road westbound for Interstate 95 north to Interstate 85 south. A loop ramp onto the freeway south to Emporia follows before Wagner Road ends at U.S. 301 (Crater Road). Photos taken 06/25/10. An 18 inch trailblazer for Interstate 95 stands along Staffordborough Road south at SSR 610 (Garrisonville Road) near the cloverleaf interchange at Exit 143. Photo taken 10/14/01. Virginia Secondary 906 turns from Commerce Street onto Washington Street within the village of Occoquan. The route represents a former alignment of Virginia 253 leading south to Woodbridge. Pictured here is a SSR 906 southbound shield assembly posted on Washington Street ahead of Center Lane. A state-named Interstate 95 shield directs motorists east on Commerce Street to Virginia 123 (Gordon Boulevard) south for its interchange with the freeway (Exit 160). Photos taken 08/31/09. "Speed limit on rural Va. interstates increasing to 70 mph." Richmond Times-Dispatch, October 21, 2010. "70 mph now legal on I-95 between Hanover, Spotsylvania exits." Richmond Times-Dispatch, December 6, 2010.